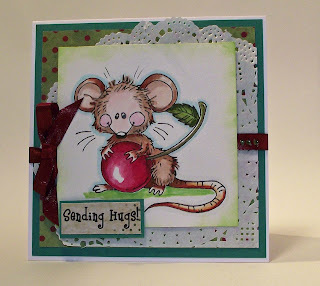 Todays post is for the new challenge starting today over at Cards Galore Challenge blog with the theme of anything goes. The challenge is sponsored this time by Meljen's Designs with a prize for the winner of 4 of their wonderful whimsical designs. I chose the house with a cherry for my card. He's cute! I started with a 5x5 inch white cardbase with a tent -fold. I then matted some plain green card stock together with some green with red polk-dots paper to the front of the card. A white doilly and some red ribbon was then attached for decoration. The image was printed onto white card and coloured with watercolours. I used some StäzOn bright green ink to distress the edges and roughed the edges a little. I then adhered the image to the fron of the card and finished the card off with the sentiment 'Sending Hugs'and 3 green gems. Feel free to join in with us in this ANYTHING GOES challenge. All crafts are welcome and we are looking forward to seeing what you can produce. Don't forget the prize waiting for the lucky winner is FOUR lovely digi designs from Meljen's. Please do pop over to see the challenge site here and take a look at the fabulous DT projects there. Great card Angela, I love the way you used the doily, I buy/make them and then get stuck as to how to place them!